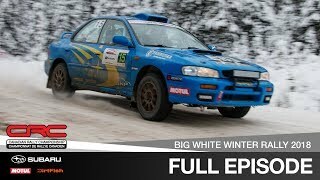 With Sylvain Vincent retiring from competition at the end of the 2015 season, it fell to his son Simon, to guide their iconic 1994 Subaru Impreza through the icy roads surrounding Maniwaki, Quebec. 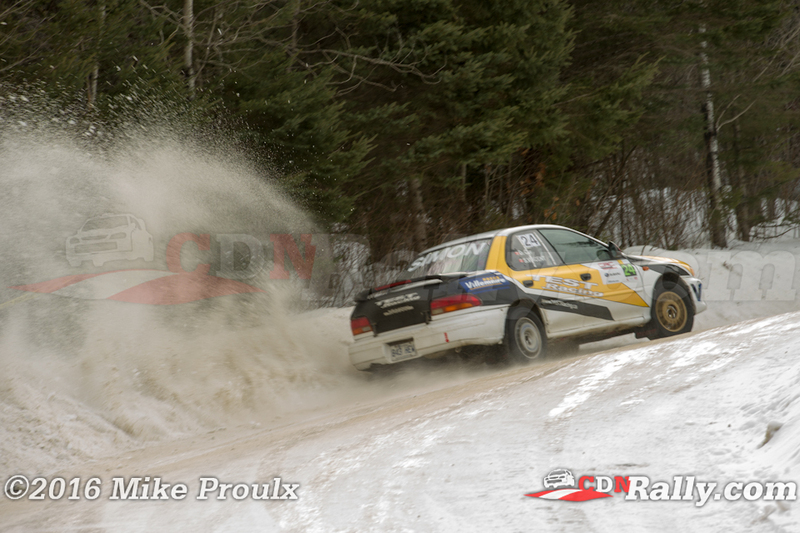 And with Dominique Cyr codriving, Simon certainly impressed at Rallye Perce Neige. 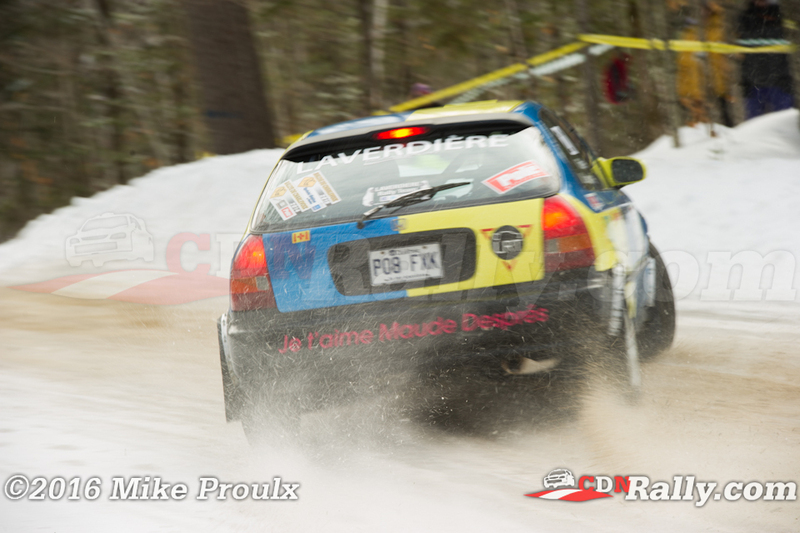 Unsurprisingly, the challenging roads of Perce Neige wreaked havoc on the standings. Former Ontario Champions Peter Thomson and Jeremy Norris both came to the event with the potential to win. But both will likely look back at the rally as one to forget. 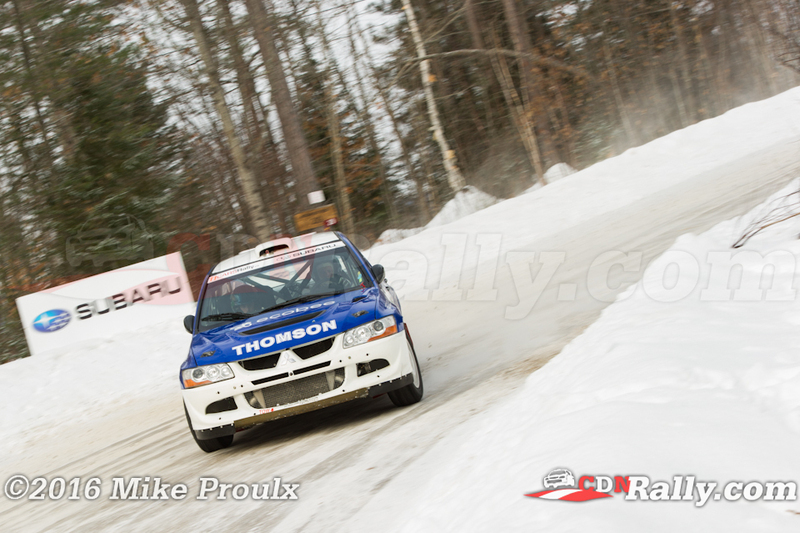 Norris and codriver Jeff Hagan were pushing extremely hard all day. 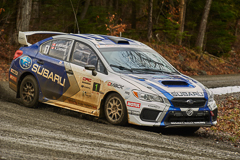 In tackling the morning's national stages, Norris pressed his Subaru to its limits, trying to keep up with the more powerful and better equipped cars in the Canadian Rally Championship. 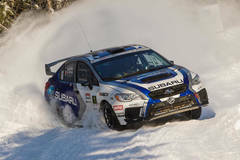 But in the early stages of the OPRC event, Norris ran wide on a sweeping right hand corner, clipping the snowbank, which sent his STi tumbling end over end. Thankfully, neither Norris nor Hagan was seriously injured, but Norris was taken to hospital for precautionary reasons after reporting neck pain to rally medics. 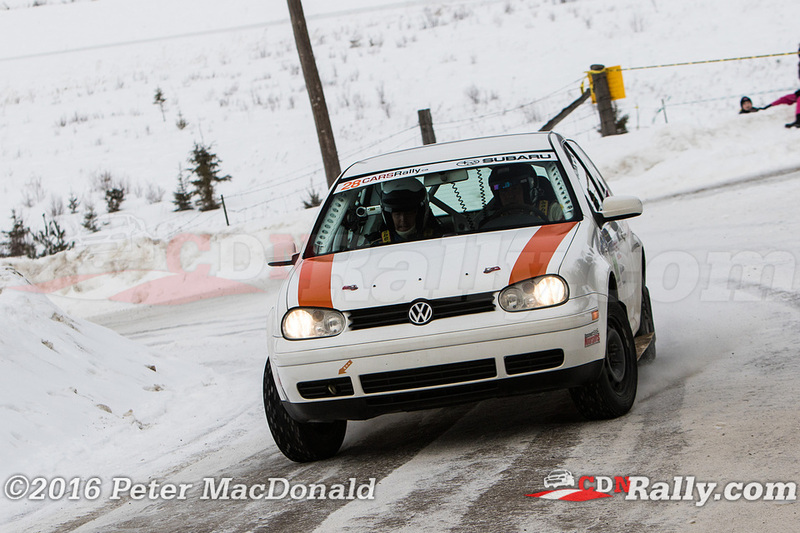 After a year away from competition, Peter Thomson returned to the OPRC aiming to get back into the swing of things. Thomson led the pack for the entire first leg, posting very impressive stage times in the afternoon and earning himself a sizeable lead. 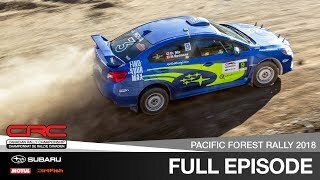 Unfortunately for Thomson and codriver Darragh Mullen, two off-road excursions in the second half of the event put them well down the order and out of contention. 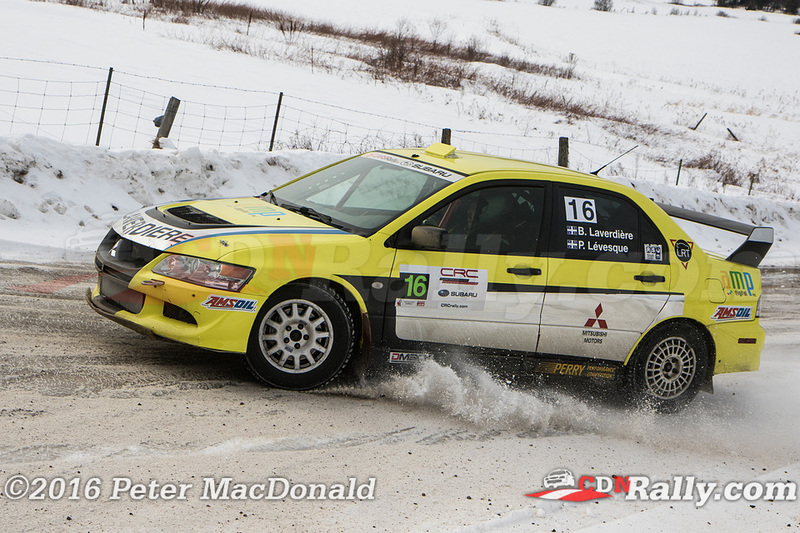 Nonetheless, the pair finished, earning valuable points should they decide to return to more OPRC events this year. 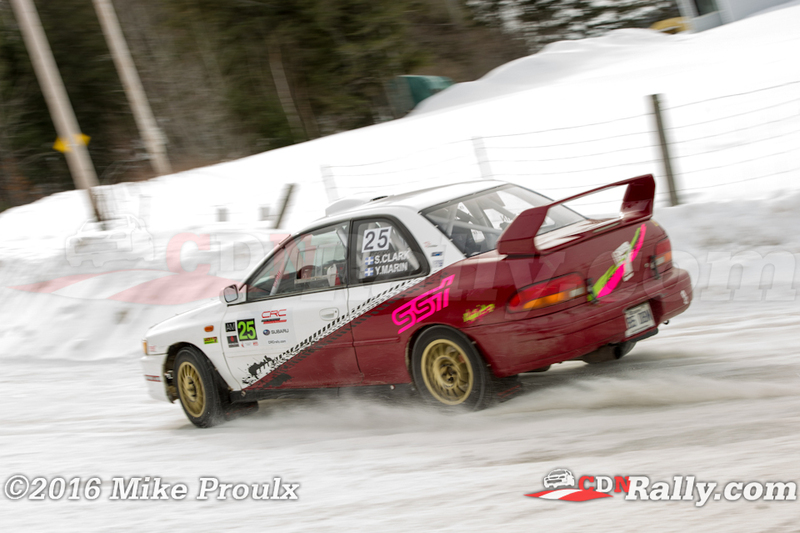 Thomson's drama left Bruno Laverdière and Patrick Lévesque to battle with Vincent and fellow Subaru driver Eric Vlasic, creating a three way fight for first place. As afternoon turned to evening, Laverdière and Vincent posted comparable times, with Vlasic not far behind. 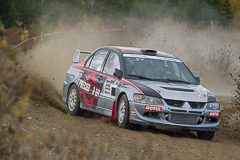 However, between Laverdière concentrating on a strong finish in the national category and Vincent finding even more speed in the latter half of the rally, Simon pushed his way into the top position. And once Vincent surpassed the Mitsubishi driver, he never relinquished the lead. 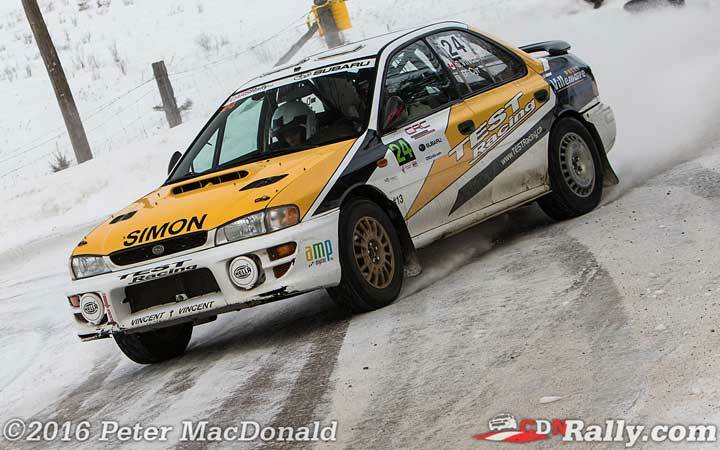 For the Quebecois, it was his first ever victory as a rally driver. 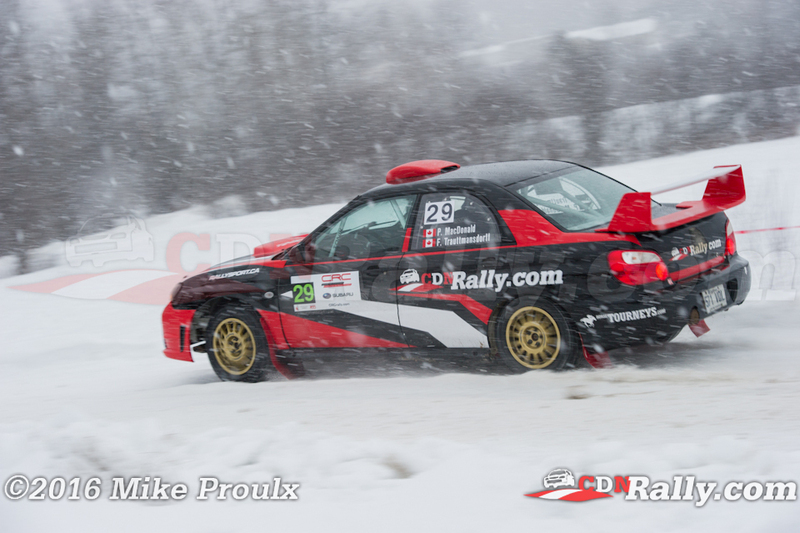 "It's great fun to win the OPRC Perce Neige" said Vincent, "(There) was very icy conditions but we went through the event with a good mentality of doing the distance, and it paid off." 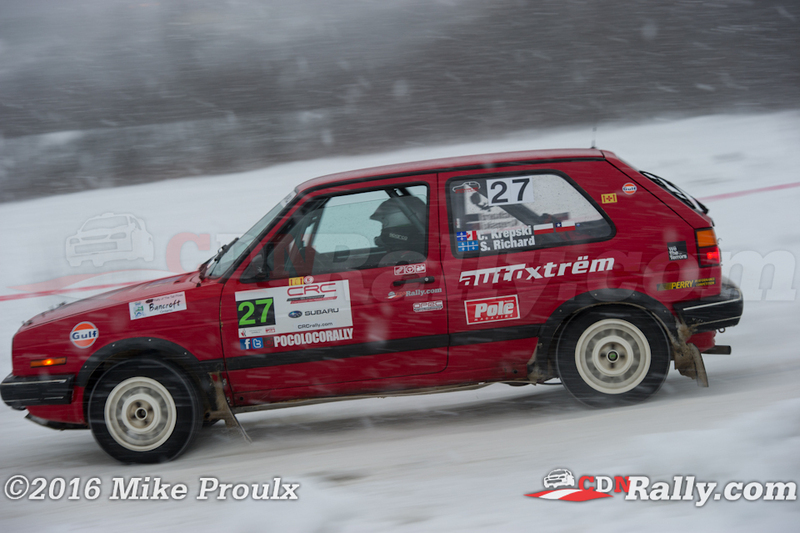 Bruno Laverdière finished second after a solid rally of his own. It was Laverdière's first podium in the Ontario Championship. "No big problems, the car went well" Laverdière recalled, "Our notes, everything was fine - big success today." 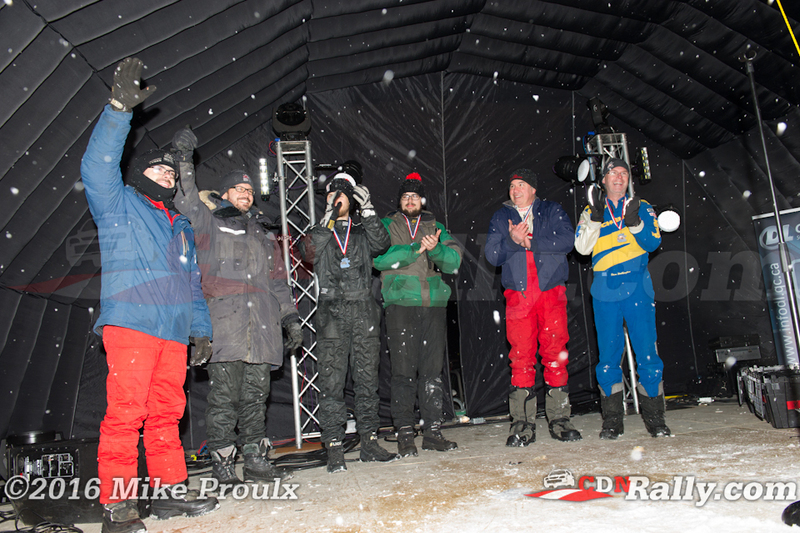 Eric Vlasic and Hubert Gaudreau rounded out the podium after battling hard throughout the event. 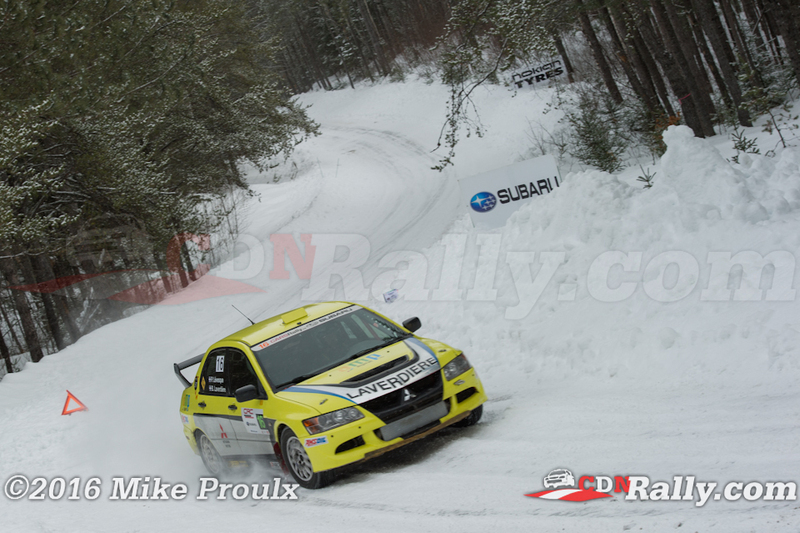 It was a good showing for Vlasic, who used the same car that went off the road heavily at the Rally of the Tall Pines back in November. 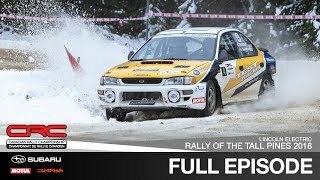 "I only had one set of studded tires so I opted to go out on tractionized ice for the morning stages" Vlasic admitted, "(We) had a big off, bent the left lower control arm, got through the stages, came back to service and put on the studded tires... night and day difference between studded and tractionized. And got a good overall result!" 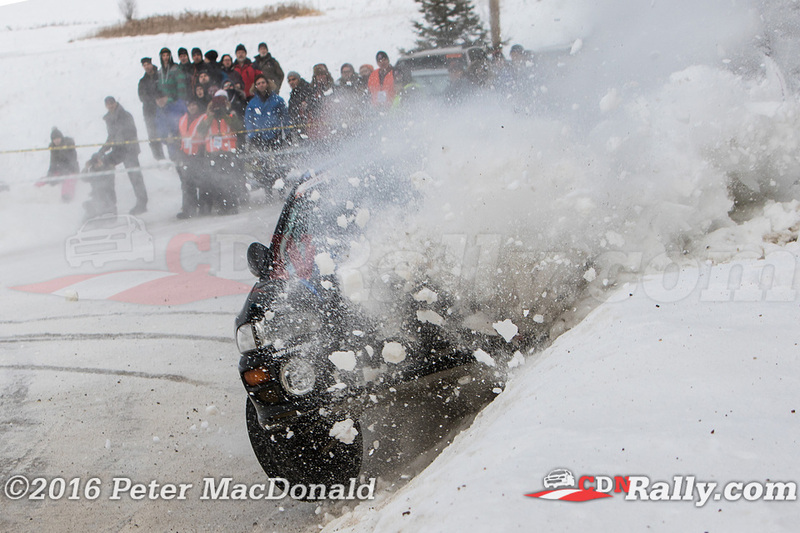 Nicholas Laverdière and Vincent Trudel finished first in the 2WD category, followed closely by Richard Kirton and Steve Walkington. Chris Krepski and Sébastien Richard rounded out the podium in third, making their return to the series after a year away. 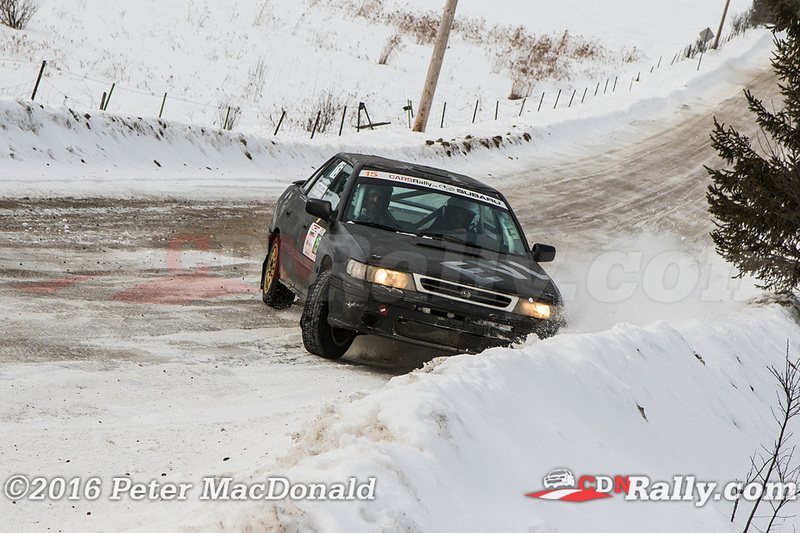 The OPRC now goes into its spring break, with competitors returning to the stages in early May for the Lanark Highlands Forest Rally. The Eastern Ontario event will again feature two distinct stage roads, with the Umpherson's Mill stage pairing with Lavant Mill Road again for 2016.